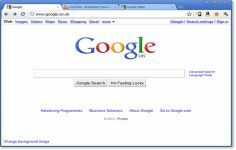 Google Chrome is a web browser based on the Chromium project developed to be a faster and innovative browser. Besides performance issues, a distinguishing feature of Google Chrome compared to the competition is the fact that it has a dedicated storage space and a dedicated process for each tab or window to gain stability and security. 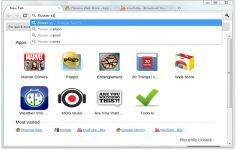 The browser keeps the classic features such as tabs, private browsing, bookmarks management, integrating search engine in the address bar and add-ons support. But Google Chrome stands out from the competition by including a synchronization system browser with a Google account to benefit from a better integration of services with the operating system. It manages the creation of shortcuts to applications such as GMail Drive, Events, Play, etc. There is also the integration of Flash Player natively in the browser which frees the user to install third party software or a PDF viewer. The Multi-tab option allows to select multiple tabs at once just by pressing Ctrl. Thus, it is very easy to delete, move, or refresh a group of tabs with a single click. The address bar of the browser also serves as the search bar so user can directly type keywords in it and access the results of the search engine most used in the world. Curently we don't have any log information about Google Chrome version 74.0.3729.75 Beta for PC Windows. We will this change log update soon!